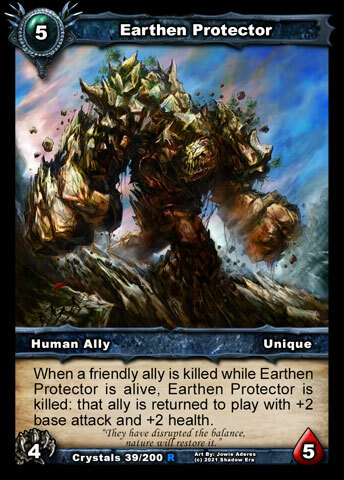 Earthen Protector was among the first, and most powerful, cards to rely on combos in Call of the Crystals. Hidden behind an Aeon , he can create a whole new level of threat. Humans have little recursion, but this guy can abuse it with utter delight. He also boasts a healthy attack, making him a genuine threat all by himself. 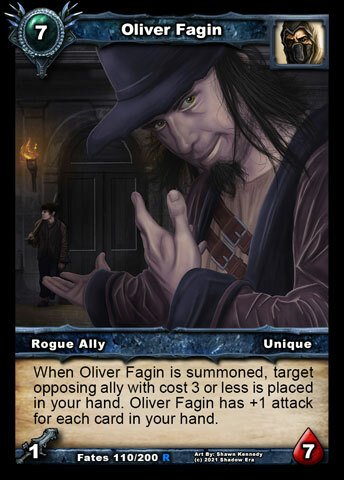 Ability: When a friendly ally is killed while Earthen Protector is in alive and can be damaged, that ally is returned to play with +2 base attack and +2 health, and Earthen Protector is killed. When Layar first began falling under the might of the Shadow's growing forces, their first reaction was to search out allies from the other nations. Though it had been a thousand years since the Last War, few of their neighbors felt any need to intervene on behalf of the besieged nation. Despite the nightmares the Shadow seemed to be bringing from other worlds, no one seemed to deem them a threat to the rest of Balor. It was not until the assault on Castle Layar cost the country its capital that the few leaders remaining came onto a plan. Using the energies of the Shadow Crystals, they fused magic into one of the statues that had been under construction for shipment to their new fortress atop Mount Balor. Most crumbled into nothingness, which caused the creators to weep in despair and frustration. It was almost a week of failure before any meaningful progress was made, but these attempts made little more than useless lumps of moving clay. At last, as their rage over the futility peaked, the work paid off. The birth of this 'Earthen Protector ' ushered in a new moment for the failing cause of the humans. Not only had they found new ways to create soldiers to fight along side themselves, but they'd also created a weapon that could reveal what was at stake. By promising more such soldiers, Layar was able to convince Lyth and Ellos to join their side in the conflict.